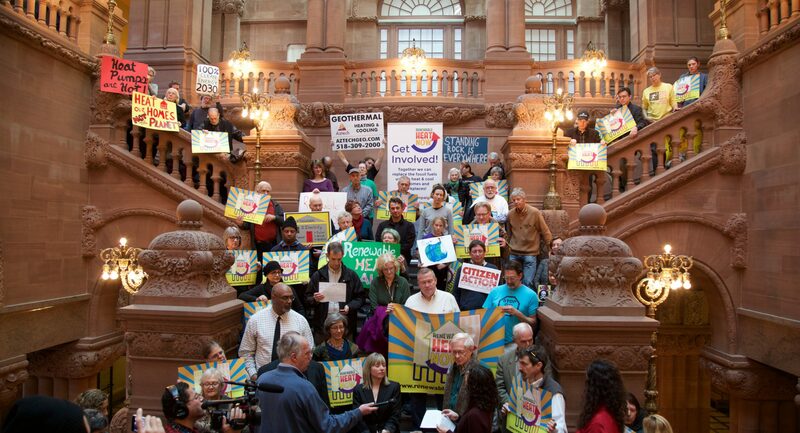 Renewable Heat Now Rally in Albany – Renewable Heat Now! 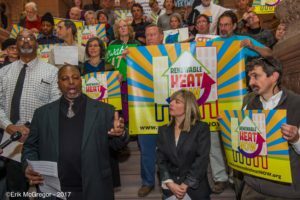 December 6, 2017—Albany, NY— As lake effect snow hit parts of Upstate NY on Wednesday, supporters of renewable heat gathered in New York’s Capitol Building to demonstrate their support for renewable heating. 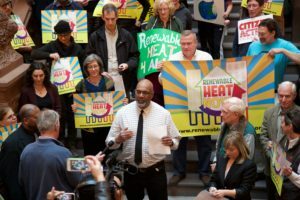 Homeowners, energy activists, and installers called on Governor Cuomo and New York State to aggressively ramp up support for renewable heating technologies, such as ground-source (geothermal) and air-source heat pumps, in order to reduce New York’s dependence on fossil fuels and meet New York’s greenhouse gas reduction goals. 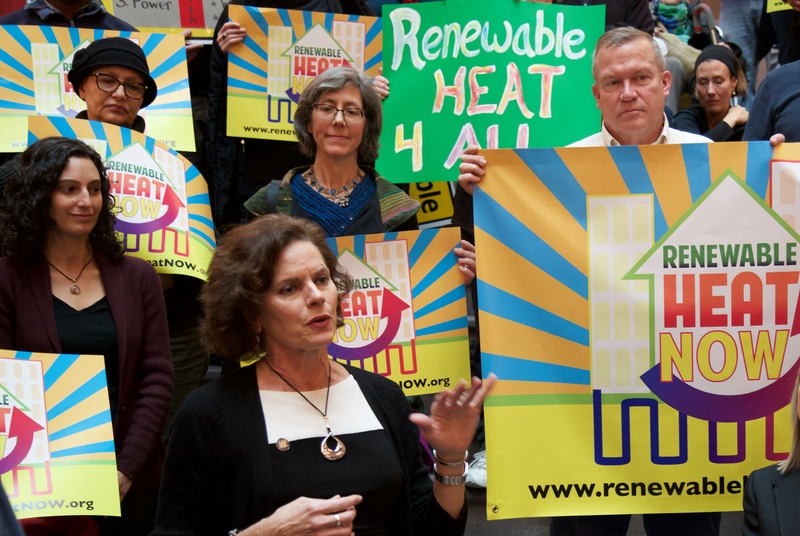 The Renewable Heat Now campaign has already seen successes, as the New York State Energy Research and Development Authority (NYSERDA) this year announced $15 million in rebates for geothermal system installations and $10.95 million in incentives for air source heat pumps. On November 29, 2017 Governor Cuomo signed a bill that allows geothermal to qualify for on-bill financing, allowing homeowners to pay for the installation of their systems over time through their energy bill. This allows many homeowners to see immediate cost savings due to the efficiency of the new systems. 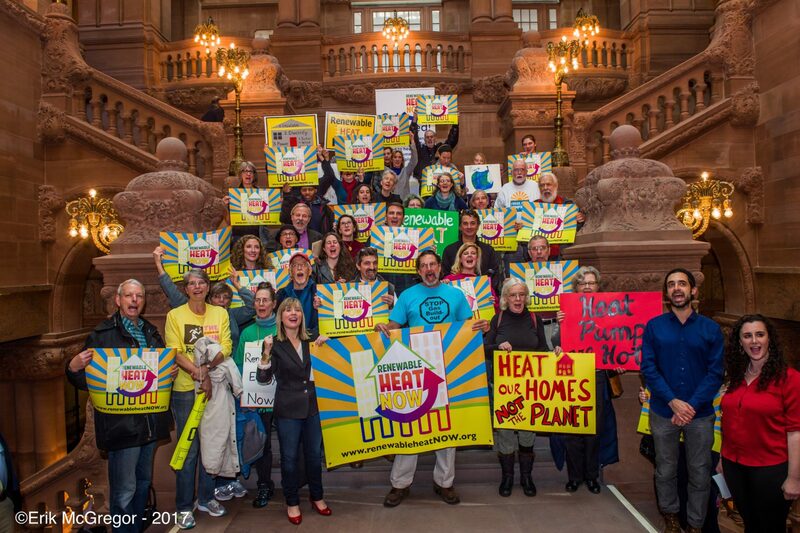 Over 38% of NY’s greenhouse gas emissions come from combustion of fossil fuels in our buildings, mostly for heating. Physicians, Scientists, and Engineers for Healthy Energy estimate that in order to achieve NY’s goal of a 40% reduction in greenhouse gas emissions by 2030, 126,000 buildings per year must convert from fossil fuels — including natural gas and oil — to efficient electric heat pump systems. Efficient electric heat pumps are commonly known and used in other states for heating and cooling needs. New Yorkers who move south are often astonished to find how cheaply, safely, and comfortably they can regulate the temperature in their homes with heat pumps. Geothermal systems are the most efficient way to heat and cool buildings in New York and are a complete alternative to burning fossil fuels. Cold climate air source heat pumps are also a good alternative for many buildings. Lack of knowledge of these alternatives, however, results in over 90% of NY homes still relying on combustion heat from gas, oil, and propane. “Without swift and dramatic action from Governor Cuomo and other leaders, we face nothing less than climate catastrophe,” said Laura Shindell, New York Organizer for Food and Water Watch. 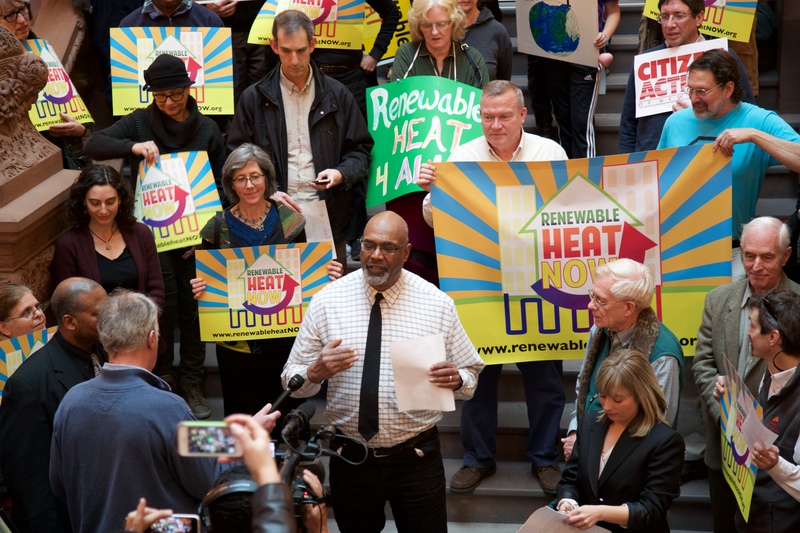 The Renewable Heat Now campaign launched in 2017 to help educate New Yorkers and advocate for incentives and policies to promote this transition. The campaign’s educational talks by experts Dr. Arjun Makhijani and Jay Egg have drawn crowds all over the state, from curious homeowners and architects to energy activists. The campaign’s platform calls for updated building codes to eliminate fossil fuel heating in new construction, rebates and incentives to promote installation of heat pumps, and policies and assistance especially for low-income homeowners to afford the initial investment in equipment. 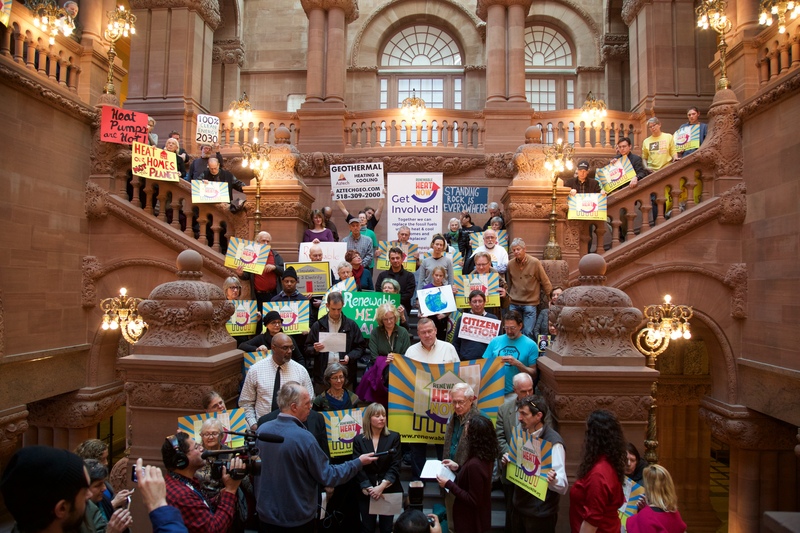 Rally speakers also proposed alternatives to New York State’s plans to run the Empire State Plaza on a combined heat and power plant burning fracked gas. “We are calling on Governor Cuomo to open a request for proposals so that engineers that are learned in geothermal technologies can implement practicable solutions for the proposed Sheridan Ave. Project, to supply renewable energy for the Empire State Plaza and other buildings. New York State can be a national model for sustainable energy,” said Merton D. Simpson, Albany County Legislator and Co-Chair of SHARE.